How can anyone read stories like this one and still defend the death penalty? If juries make one mistake in 1000 it forever refutes any attempt at rationalizing the taking of a life on the grounds of a trial where human error is ever-present. Fleming, now 51, tearfully hugged his lawyers as relatives cheered, “Thank you, God!” after a judge dismissed the case. A key witness had recanted, newly found witnesses implicated someone else and prosecutors’ review of authorities’ files turned up documents supporting Fleming’s alibi. 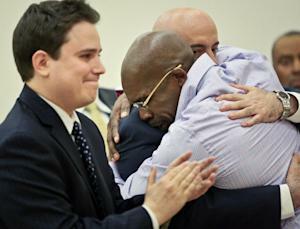 Jonathan Fleming, hugs his attorney Anthony Mayol while his other attorney Taylor Koss applaud. Prosecutors’ review produced a hotel receipt that Fleming paid in Florida about five hours before the shooting — a document that police evidently had found in Fleming’s pocket when they arrested him. Prosecutors also found an October 1989 Orlando police letter to New York detectives, saying some employees at an Orlando hotel had told investigators they remembered Fleming. Now, how does the State of New York go about giving the man twenty-five years of his life back? 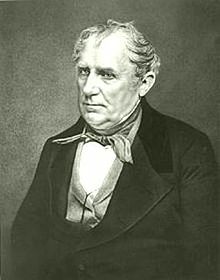 In 1823 James Fenimore Cooper wrote The Pioneers, the first of what came to be called his “Leatherstocking Tales.” The story features the aging Natty Bumpo, a white man more at home in the forest with his Mohican friend Chingachgook than in what was loosely called “civilization.” Cooper tends toward the Romantic and glorifies the native people somewhat, but his tales are one of the first serious attempts by an American intellectual to deal with the problems of an expanding white population and its effects on the wilderness and the native people. As is so often the case with Cooper’s tales — which were widely read in England and Europe and had a powerful effect on people like Thackeray and even George Eliot — the author has crafted a parable for our times. We can work past the romantically exaggerated picture of the “noble savage” and we will find in the end a tale that tells us a great deal about ourselves, things we may not want to recognize or admit are true. Cooper was one of the first to see clearly the damage we could do to the environment and the wilderness in our voracious attempt to get as much from the earth as possible in the shortest amount of time. Governor John Hickenlooper of Colorado recently signed off on what are described as “tougher” gun control laws. These laws do not address the topic of assault weapons, sad to say, but they do promise stricter background checks on those who want to purchase weapons and they limit the size of the ammunition magazines. This would seem to limit the use of such weapons as the ones used in Newtown, Connecticut not long ago that fired off multiple bullets — as many as two shots per second. In a word, it is possible that the reduced ammunition magazines will also reduce the effectiveness of assault weapons, which are clearly designed to kill people and not put food on the table of a Sunday. One can only hope. In any event, Colorado now follows New York with its tougher gun control laws and leaps ahead of Washington state and New Mexico both of which recently failed in their attempts to pass such laws. Needless to say, the Federal government is still talking about restrictions and the thinking is that after talking the issue to death they will swing and miss the ball entirely on the issue of gun control. So what else is new? “I’m telling you, they have overreached, and there are going to be electoral consequences,” said Republican Sen. Greg Brophy. And this seems to be the norm. Aside from the fact that several Sheriffs in Colorado have said they will not enforce the Colorado law (which is interesting in itself), those who profess to be protecting the Second Amendment to our Constitution insist that they will make sure those who voted for the new laws in Colorado are voted out of office come the next election. This, of course, is what happened at the Federal level in 1994 when a Democratic Congress under President Clinton passed stricter gun control laws and many of those who supported those laws were summarily defeated in the following elections. The opponents of such laws at that level, again in the name of the Second Amendment (which very few seem to understand if they read it at all) are supported by the NRA which in turn is supported by the gun manufacturers who have a not-so-hidden agenda and limitless funds and who are able to pretty much guarantee that those who support strict gun control in political offices do not hold those offices for very long. What spiteful personalities these important people have and such tiny minds as well. But this is the sword of Damocles they hold over the heads of anyone in public office who has the audacity to support stricter gun control laws — and this is why Colorado is the exception to the rule and why we are not likely to see any laws with teeth come out of the U.S. Congress this time around — or anytime soon.